The other day, we started our morning battling. I dropped the first gauntlet by reaching for an apple red ruffled top with a pair of blue jeans. This caused my two year old daughter to scream, "I don't want to wear pants. I wear a SKIRT!" She stomped over to the closet with her little feet sticking out of the holes in the blue sleepsack and reached for a hanger. "I wear Hello Kitty SKIRT!" The "Hello Kitty SKIRT" is a full fledged tutu. The waist is banded with a glittery silver belt stamped all around with Hello Kitty's face. The skirt flares out with a swath of light pink, then bright fuchsia, and juts out shamelessly, creating a halo two feet wide around my daughter's pale, thin, naked thighs. "Well, okay," I said, "but you have to wear some leggings, ok?" As she saw me grab a pair of black leggings, she screamed out, "NO, I don't WANNA wear PANTS!" "Don't worry. You can still wear the tutu, but with leggings, ok?" To demonstrate, I helped her out of her sleepsack and pajamas, changed her diaper, slipped on the ruffled top and then pulled the tutu up to her waist before reaching for the leggings. "NO! NO! NO PANTS!" she screamed when she was where my hand was headed. "It's too cold today. You have to wear something under. You aren't even wearing tights." By this point, her face was covered with snot and tears and she was convulsing. This wasn't the first of its kind. The battles started a few weeks ago when she watched Cinderella for the first time during our Friday movie night. To teach our son some lessons on compromising, we told him that his sister would choose the movie that night. We had never watched a "girlie" movie before and our choices were limited to a set of Disney DVDs that my husband and son had impulsively purchased during a Costco trip. She hadn't really sat through a whole movie before, not feature length anyway. She usually watches for about 20 minutes and then scuttled around from one toy to the next, like a butterfly dancing from flower to flower. Not this time. She sat in the crook of Jeff's arm, from the opening scene to the credits, eyes popped open, jaw dropped, completely mesmerized. The next morning, after I dropped off my son at preschool, we passed a random stranger. 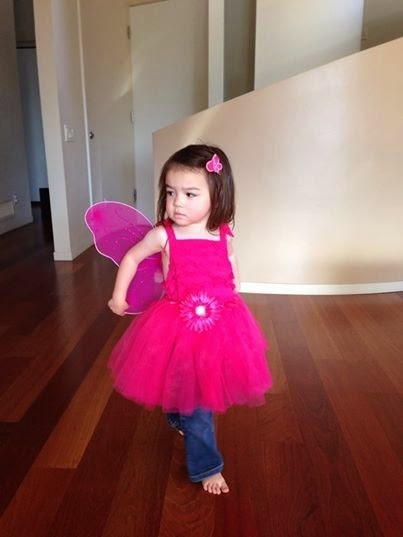 Seeing S dressed in her poofy tutu, the lady flashed S a big smile and said, "Hello, little Princess." After the lady passed, S turned to me and said, "Mama, she said I'm a Princess!" That evening, S came up to me as I stood at the kitchen sink and proclaimed, "I am a Princess now." I never worried about having a princess for a daughter. When my friends read articles and blog posts about the pitfalls of exposing your daughters to princess-dom and proclaimed their boycott of all things princess-related, I didn't pay much attention. Surely, they are over-reacting, I thought. We felt safe knowing that our daughter had an older brother, who had to date not been exposed to any girlie movies or toys. Our house was filled with legos and train tracks, and we had no more room for more toys. Besides, what were the odds of having a princess daughter? When growing up, I had no delusions of royalty. I was the chubby kid with the bowl hair-cut. I was the ugly one in the family. No one told me, but it was obvious by the way my sister got all the attention for being cute. I didn't like to wear skirts because I had thick calves. I didn't even dare dream of being a cheerleader, although one girl in my seventh grade class who was chubbier than me still made the team. (But she knew how to summersault.) I never made the cut for being a princess in my own life, so how could I have even imagined that I would have a princess daughter? And if I were to have a princess daughter, didn't it mean that I would have to become the wicked witch? When my daughter's verbal dam burst and she started proclaiming her need for a tutu, I hesitated for a second. I do know a couple of women in real life who are still waiting for their prince charmings to show up and whisk them away. Often, I look at them and think, "Girl, you got so much more going for you than any man could ever do." But when I think about it, these women aren't really waiting around. Not really. They have their lives and careers in order. They have their social lives. They got it together, except that they are waiting for that icing on the cake. What's so bad about that? I then thought about what my son's preschool teacher told me. She told me that they have some serious problems when the kids want to play act "Frozen" because none of the girls want to play the role of Anna, the younger sister who is the princess and the love interest. All the girls want to play Elsa, the queen with the power. Sometimes, they have to tap one of the boys to play Anna (well, I guess it beats playing the role of Sven). Maybe all these years, all the wanna-be princesses didn't really wanna be princesses after all. Maybe they chose to identify as princesses because all the queens in the old Disney films were wicked and wore ugly dresses. I also thought about my reaction to Cinderella. How I found her beautiful, how I loved the way all the good creatures around her loved her and came together as a community to help her in her times of need. I felt aggrieved for the injustice she suffered and empathized with her longing for a better life. And when she finally received what was her due -- a return to the kind of life that should have been hers to begin with -- I interpreted the movie to be about social justice. How could I begrudge my daughter for embracing her? Maybe that is what all these little girls want when they proclaim their desire to be a princess. They want to be the star in their own movie. The good one. The beautiful one. The triumphant one. Isn't that what we all want? Later that day, I ordered six more tutus for my daughter. One for each day of the week. Let her have her moments, I say. She can twirl as she wants. And wave her wand. And be as beautiful as she wants to be. Yes, there are pitfalls in these films. One I may not show my daughter again is The Little Mermaid, which I found to be pretty disturbing. And the role of the pixie in Peter Pan was sexism embodied. But maybe having healthy role models in real life will count for something. And maybe I can strive to be that role model, instead of playing the role of the wicked witch.